Agartala recruitment rally. 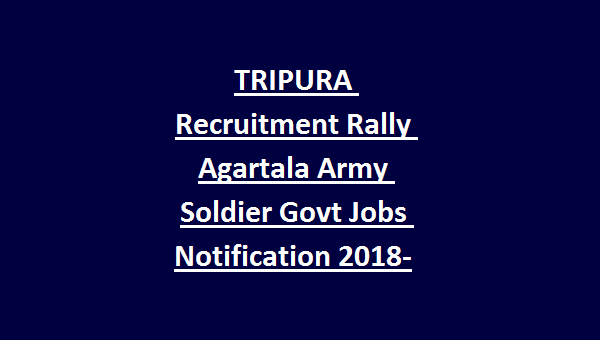 This Army recruitment rally of Agartala is only for Tripura state candidates. Agartala Army Recruitment Rally starts on 21-02-2019 and ends on 25-02-2019. SSLC or Matric or 10+2/Intermediate qualified candidates can apply online for this Agartala Army Soldier vacancy. Candidate’s selection for this Agartala Army recruitment rally soldier jobs is be based on Physical tests (PST/PFT), documents verification, medical tests and written exam. 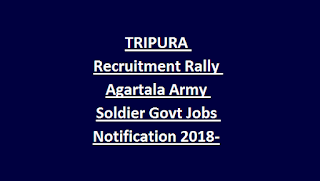 Age limits, how to apply online for this Agartala Army Recruitment rally are updated below. There are many vacancies under Tripura cadre. For Soldier GD Posts 17.5 years to 21 years. Above said physical standards and eligibility criteria having candidates can apply online for this Agartala Army Recruitment Rally. Last date to online application form submission at www.joinindianarmy.nic.in is 31-12-2018.